I’ve been confirmed for this show. 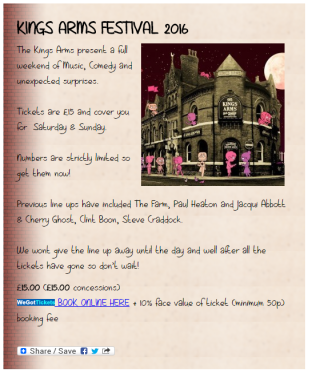 Tickets £15 for a three day festival of music and comedy. The King’s Arms is owned and run by Paul Heaton, of The Housemartins and The Beautiful South. It’s my third time playing this festival – the first time was as singer with Adventures of Salvador – and I’m really looking forward to it. I’m on in the snug, downstairs, at 3:30.